Update: See this link for the results of the Humpback Comeback Project in the AVIVA competition. With just a few more days left to vote for the “Humpback Comeback” Project in the AVIVA Community Fund’s competition, I feel I need to crack. I need to crack and respond to the many questions about who “we” are, the humans behind the Humpback Comeback Project. We haven’t wanted to answer because of course, it isn’t a comfortable thing to put yourself “out there”; it’s been a broad community effort where we can’t mention everybody involved and; we didn’t want to detract from what the Project is about – the whales and understanding the risk of entanglement. But with all the remarkable support the Project has received, I feel we owe you. Maybe too, in revealing the human element, the dedication behind the Project will be even more apparent and you’ll know all the more that your votes have been well invested. So who are we, the volunteer effort behind the Humpback Comeback Project? Below I include the biographies provided in our submission to the AVIVA Community Fund competition. Please realize that the information was written with the purpose of relaying our commitment to the Project and to our community. Self-promotion is difficult and awkward but the we did it to help the chance of success in the funding competition. In complete self-mockery, we also include photos of ourselves so you can see the human faces behind Humpback Comeback. The photos were taken when we were out looking for humpbacks last week, on the cold Northeast Pacific. We recognize that the photos wouldn’t serve us well on Plenty of Fish but that’s not their purpose . .. for us, it’s about plenty of whales! Please know too that there are so many more who have contributed time, resources and sightings – local whale watching companies (e.g. Stubbs Island Whale Watching began the data collection effort); Dr. Alexandra Morton (shared all the humpback data she had collected since the 1980s); our fellow members of the Marine Education and Research Society (Caitlin Birdsall, Leah Thorpe and Heidi Krajewsky) and many more from Northern Vancouver Island, B.C., Canada. Thank you so much for caring and for your support. Chrisite McMillan. Vote 5 . . .
Christie McMillan (Alert Bay, B.C.) has spent two years as a Humpback Whale Studies Research Assistant and member of the Atlantic Large Whale Disentanglement Network at the Provincetown Center for Coastal Studies in Cape Cod, Massachusetts. 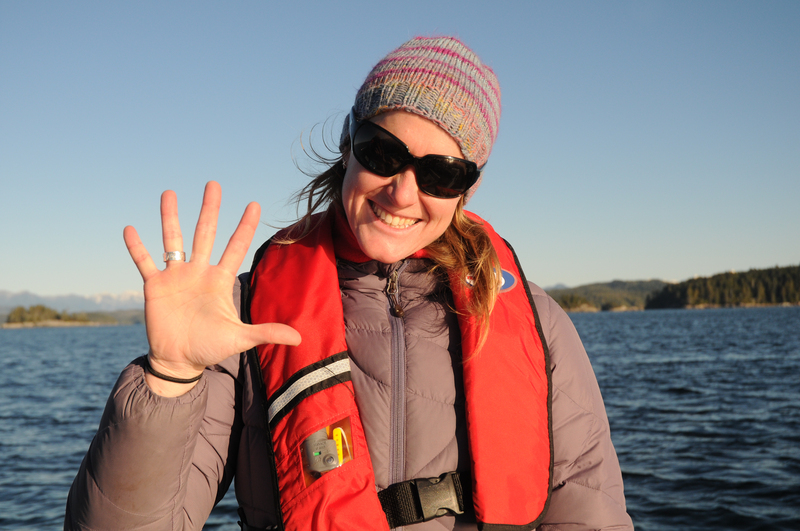 Working with some of the world’s experts in entanglement research and humpback whale biology, she has gained skills and expertise in both of these fields. She has also worked as a Cetacean Research Technician for Fisheries and Oceans Canada, and an environmental educator and Naturalist for various non-profit and eco-tourism organizations. She has played a key role in collecting, processing, and analyzing our humpback whale data since 2005. Jared Towers. Vote 7, 7 . . .
Jared Towers (Alert Bay, B.C.) is a Cetacean Research Technician with Fisheries and Oceans Canada, and has been operating boats and studying wild whales off the coast of British Columbia for the past 23 years. He also is the Founder and Past President of the North Island Marine Mammal Stewardship Association, an organization dedicated to finding the balance between sustainable eco-tourism and marine mammal conservation. He is a skilled researcher, educator, and Captain, having worked in locations all over British Columbia, as well as in Mexico and Antarctica. 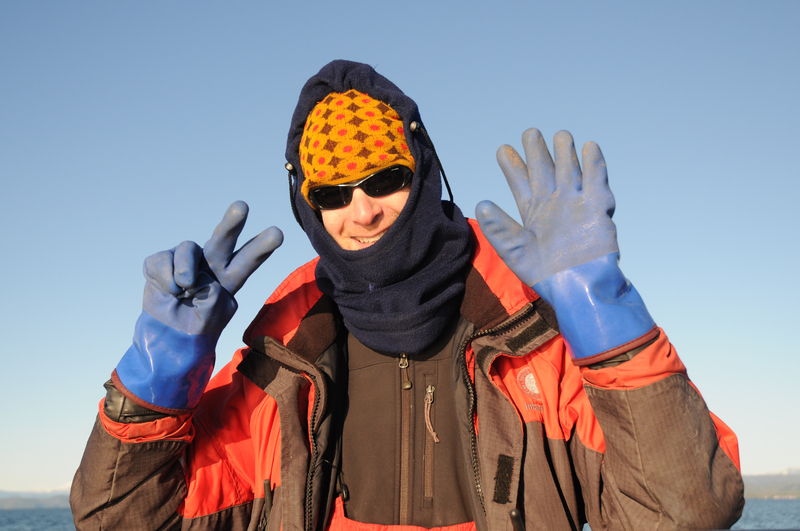 He has been involved in our humpback whale research for the past 7 years. Yours truly. Jackie Hildering. Vote 3 . . . Vote #5773! Jackie Hildering (Port McNeill, B.C.) has been collecting and processing our humpback whale data for 7 years. She is a highly respected marine educator with a very strong connection to the local community. She has worked as a marine naturalist for 12 years; was Fisheries and Oceans Canada’s Education Coordinator for 7 years; runs a Young Naturalist Club; is President of the local dive club; and works for the SOS Marine Conservation Foundation. 2010 winner of the Vancouver Aquarium’s Murray A. Newman Award for Excellence in Aquatic Conservation. Invasive and Indiscriminate Tagging of Whales? Thanks for sharing your info . I hope you guys win …I will not be surprised if you do 🙂 It is a mighty fine project . Thank you so much Nicole. If we can just hang in the top 3, I believe we will get funding. Last year AVIVA funded 3 projects in our category when they were contributing only 1/2 the money. If only we can keep proving we have the broad community of support like yours! Jackie — everything you do is done with such enthusiasm and I am in awe of how you teach and share your love of whales and the marine environment with all of us on the North Island and most especially, our youth. You are a gift to us and I wish you the gift of winning this in return. It’s Jackie “payback for humpback” time!